I'm sharing another commission for two Christmas cards for 6 and 4 year old granddaughters. The 6 year old loves unicorns and purple is her favorite color (mine, too!) and the 4 year old loves flamingos and her favorite color is pink. Their Nana chose the images from many which I have in my collection and I did card designs which complement each other in style. I don't know who drew this image. It was in my collection of clip art. I colored the image with my ProMarkers, then die cut it with an Unbranded die. I dug out a Cheery Lynn die to cut the hat and scarf but had to add the pointy bit and the pompom myself since the hat was just a simple stocking cap and I wanted it to look more like a Santa hat. I colored the brim with white gel ink. I folded the scarf piece before adding it to the flamingo's neck. The sentiment was cut with a die from Die-Versions, and I added a glittery snowflake for some texture. 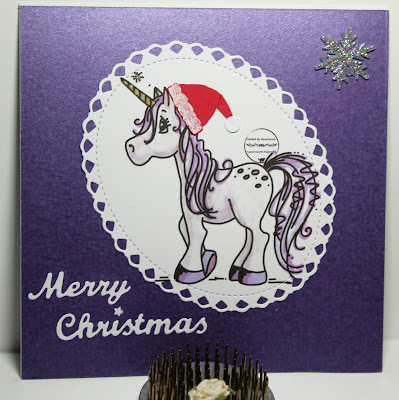 This unicorn is an image from Bugaboo Stamps. Again, I colored with ProMarkers, adding gold paint pen to the unicorn horn, then used the same Unbranded die to cut the image. The hat is cut with that same Cheery Lynn die and I added the pointy bit and the pompom to make it into a Santa hat. The 'fur' is done with white gel pen. Too cute for the unicorn lover and flamingo lover! 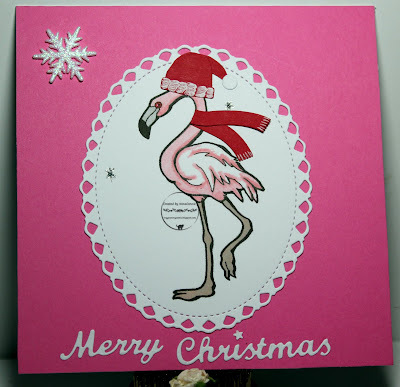 Darling cards and so pretty and fun. Have a great Christmas and safe travels. These are gorgeous Connie, love the unicorn. Have a fabulous Christmas and safe travels. 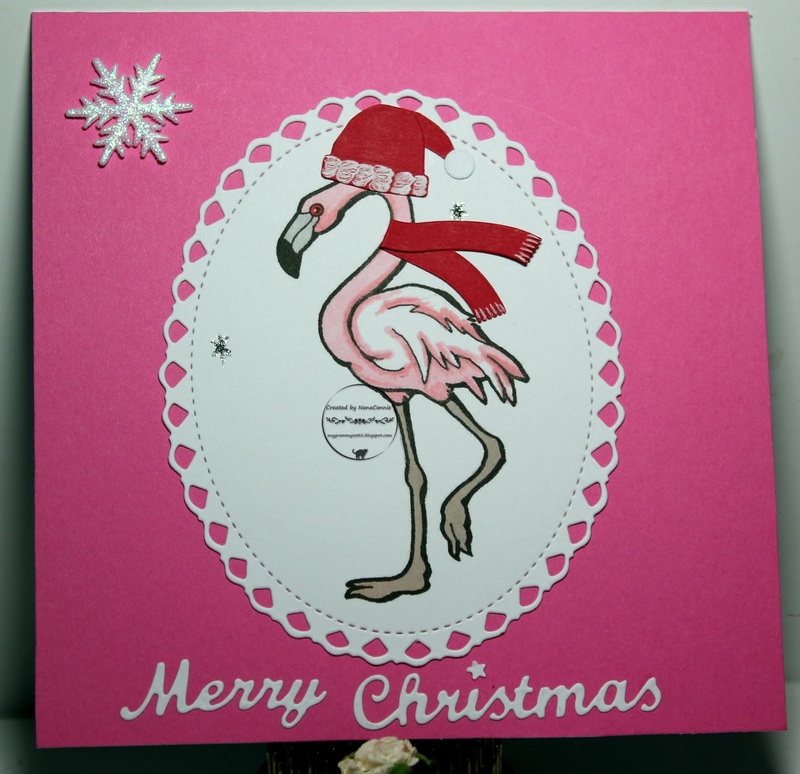 It is a very nice card with the flamingo. Thanks for joining us at CHNC. That unicorn is also very sweet! Gorgeous cards, Connie! I love the scarf and hat you added to the flamingo. It gets cold there in Florida, or so I've heard! Two cards sweet and so funny!!!! Thanks so much for participating in our Brown Sugar challenge. Hope you participate in our next!! Your unicorn card is adorable. Love the purple and the beautiful die cut. Thanks for joining in the Catch the Bug Challenge, Lisa Lynn DT.